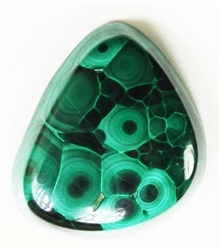 This beautiful Bisbee Malachite cab measures 16.9mm x 17mm x 6mm thickness. The WEIGHT is 20 carats. Beautiful bullseyes and a mix of greens.